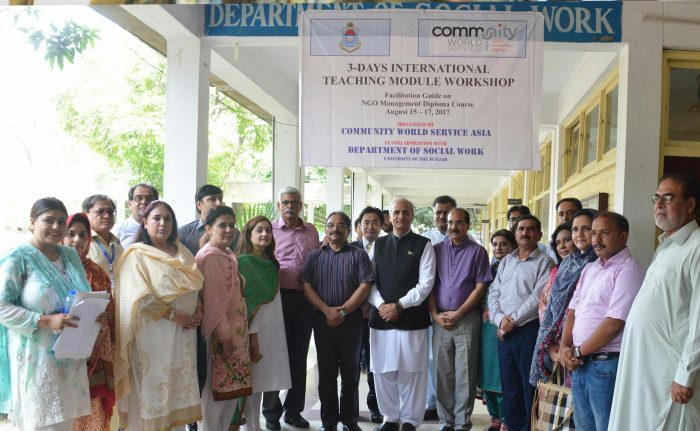 Group photo of the training participants with Zaigham Khan and the Community World Service Asia Team. Lead Facilitator, Zaigham Khan sharing the ‘Learning Pair’ approach with the participants. Zaigham Khan reviewing the learnings of the previous day with the participants. Participants were engaged in group presentations and experience sharing. Theory of Change (ToC) is a powerful tool that helps organizations and initiatives plan how they will achieve change, assess their effectiveness and communicate to stakeholders. Growing in popularity over the last decade, the international development community (practitioners and donors alike) shows great interest in using ToC for organizational planning, implementation and monitoring purpose. The national level organizations also showed interest in learning and applying ToC at their organization level. ToC help facilitate better planning to ensure that activities are linked to a detailed understanding of how change actually happens. 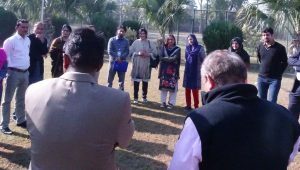 To help CSOs in Pakistan to learn the approach of and the method to apply ToC in their organizations, Community World Service Asia organized a 4-day training at Punjab University, Lahore from November 20 – 23, 2018. 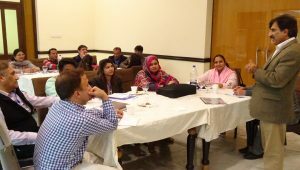 Zaigham Khan, a renowned development professional, facilitated the 4-day workshop. 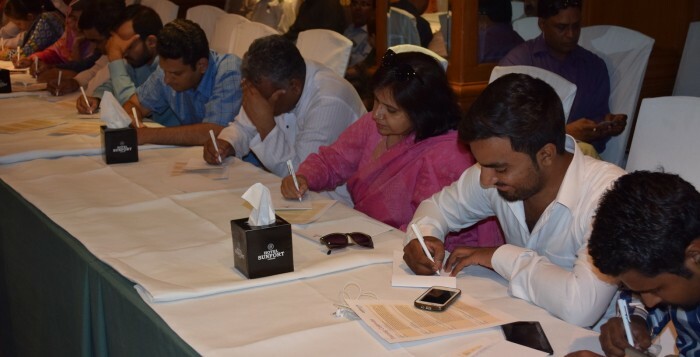 Twenty-five participants from 10 organization attended the workshop. 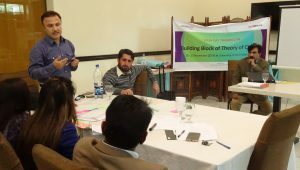 The training enabled participating organizations in identifying steps for long-term impact and strategic planning and facilitated for sequencing of theory of change approach. The participants reviewed their organizational strategy using theory of change approach and learnt the use of ToC to enhance accountability and learning. 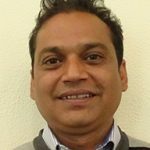 In addition, they acquired the skill of integrating ToC into their organization’s planning, monitoring and evaluation processes if future. Group Photo of alumni students of University of Sindh of the Social Media management Training in Mirpurkhas. 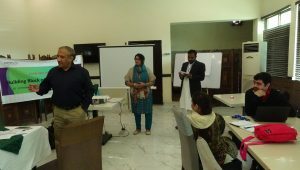 Palwashay Arbab delivering a session on “Social Media in Pakistan” in the training held in Faisalabad. Groups with the best presentation and idea were awarded with appreciation and gifts. Participants were engaged in group activities enabling them to share ideas and being creative while developing content for social media. 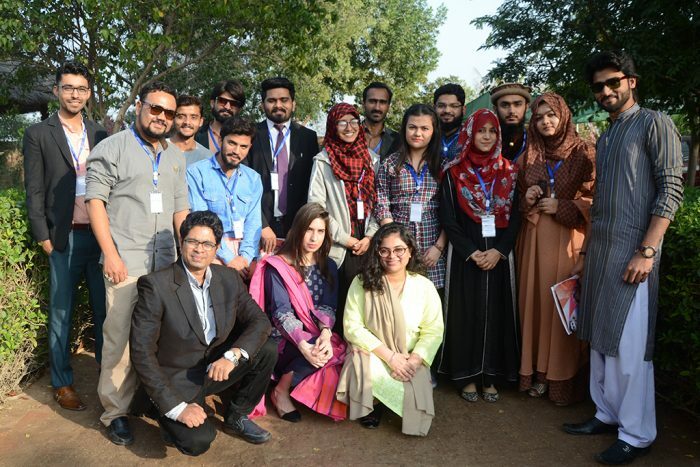 Group Photo of alumni students of University of Sindh of the Social Media management Training in Hyderabad. 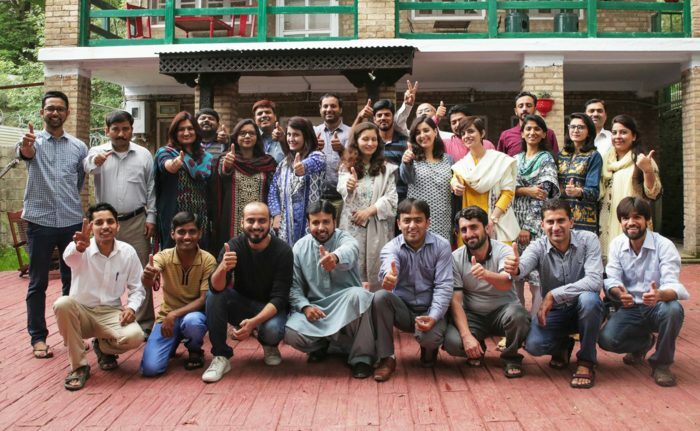 Group photo with the participants of the Social Media training in Lahore. 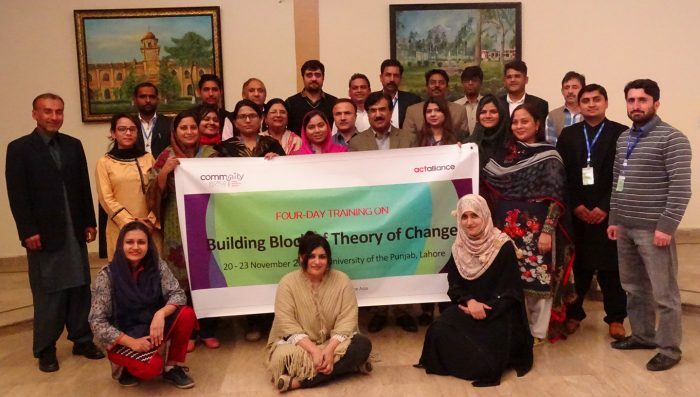 Participants of the training in Faisalabad with Palwashay Arbab, facilitator of training. Group work of participants in the session of Infographics. Alumni from University of Sindh engaged in developing an infographic during the social media training. 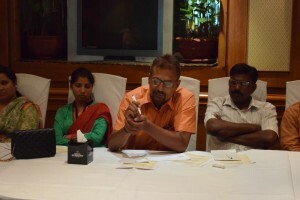 The Pros & Cons of Social Media were discussed and shared by the participants at the training. Alumni students got a chance to be creative and shared ideas on how to develop appealing visibility material to deliver a clear message to the masses. 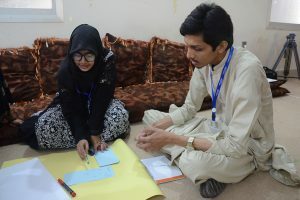 Alumni student from University of Sindh engaged in a group activity of developing Infographics. Palwashay Arbab, facilitator of Social Media Management Training, delivering a session on “Major Social Media sites and their usability”. 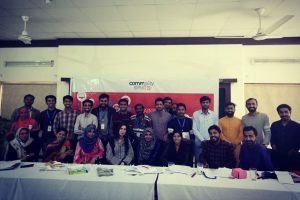 A series of trainings on Social Media Management for alumni students of the Youth United for Change network from different universities across Pakistan were held in the cities of Hyderabad, Mirpurkhas, Lahore and Faisalabad. The trainings aimed at enhancing the knowledge of students and graduates on social media, its key tools, its impact and usability for bringing positive changes and awareness. Popular social media campaigns and their impact were shared with participants. Through assignments and interactive exercises alumni students were guided on how to plan and develop their own successful social media campaigns on social causes, awareness issues and development goals. Inspiring and innovative video and photo campaigns successfully run on social media platforms by UN agencies, international aid organizations, CSOs and global academic networks were shown to participants to get inspiration from. Group activities on developing informative viral campaigns, #Hashtag activism, infographic development and creating facebook pages encouraged students to bring out their creativity and put on their thinking hats. At the same time, these youth representatives were cautioned on the cons of mis-using social media and the ethical considerations to take while developing and implementing campaigns on social networks. 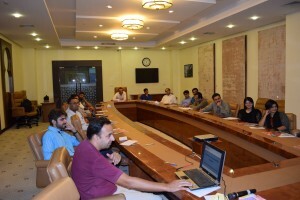 A significant session of the training emphasized on using social media tools to share knowledge on the Sustainable Development Goals (SDGs) and to develop campaigns that would help us achieve the global goals unitedly as a nation. “Youth must be united for progress and development of their country and in today’s age social media is the most effective and engaging platform which is easily used and available to everyone. 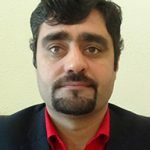 Together we can bring positive change through innovative social media and #hashtag campaigns,” Mohammad Shebaz, alumni of University of Sindh, Mirpurkhas Campus. “The training was very fruitful. The facilitator of the training delivered all sessions effectively and efficiently for us to build a clear understanding of social media and how to use it. We learnt to use social media ethically as well which most of us overlook and do not take concern of. 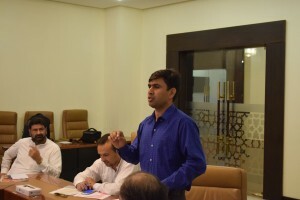 These kind of trainings fulfill the need of today’s society where social media is frequently used by most individuals, especially youth,” Ajay K. Rathore, alumni of University of Sindh, Mirpurkhas Campus. “This experience was very informative, creative and productive. 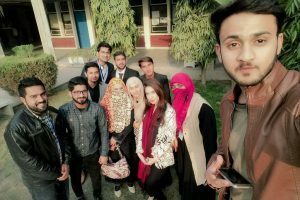 We learnt new ways of interacting in different social media sites and how to make our content effective and eye-catching.” Maham Ansar, alumni of University of Sindh, Jamshoro. 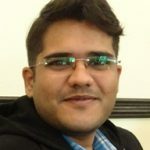 “The way of delivering sessions step by step was helpful to understand the different terms and sites of social media. 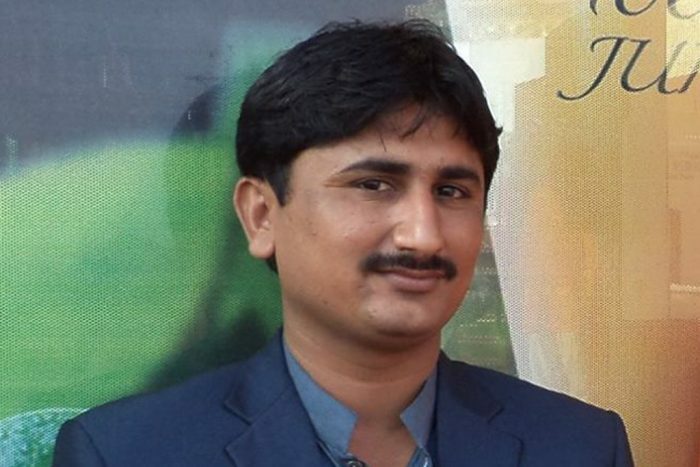 In a short period of one day, we managed to gain interesting facts regarding the techniques of using social media which we were initially unaware of.” Hoorab Ansar, alumni of University of Sindh, Jamshoro. 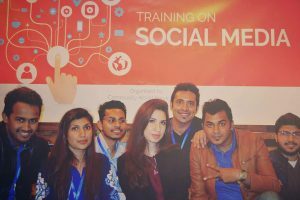 “Being an Alumni Member, this training was very helpful as social media has become one of the main modes of media to get connected globally. The frequent use of social media is productive and impactful, for youth especially. 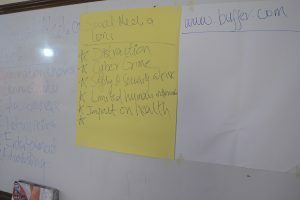 The training helped in understanding blogs and article writing and how to start campaigns within ethical boundaries. 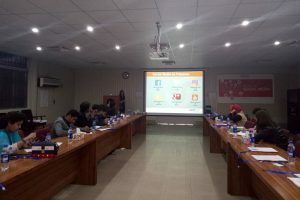 Furthermore, it helped to understand getting over the distance gap and stay connected and united with youth from the South-Asian region through social media platforms. 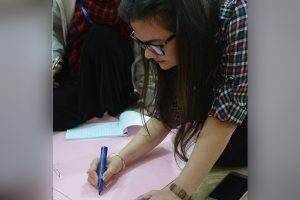 It also enabled me to develop effective and productive messaging for positive social changes in the region.” Mahnoor, alumni of University of Sindh, Mirpurkhas Campus. 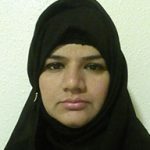 insightfully remarked, social worker Umme. Social workers act as changing agents in the society by motivating communities to think about their social and economic problems in a community forum. This enables the community to work together in achieving their mutual goals of social welfare. 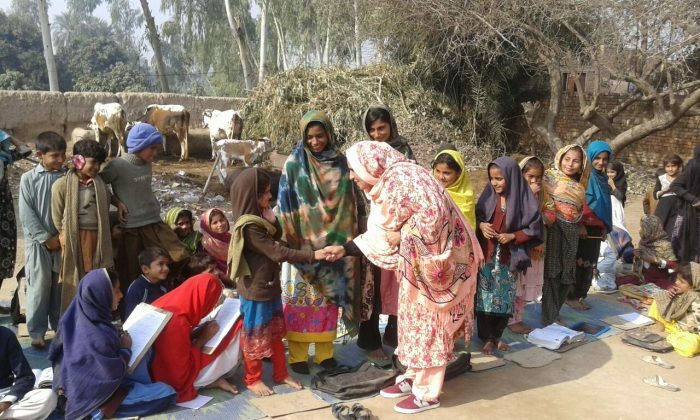 Forty-seven-years-old Umme Kalsoom Siyal, resident of one of the poorest and most under-developed areas of Punjab, Pakistan, has always had a passion for social empowerment and improvement. 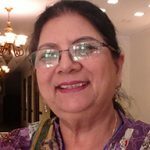 Umme is the first woman social worker from Dera Ghazi Khan, a district in Southern Punjab province of Pakistan, and home to a community that largely discourages women from stepping out of their homes, even for basic needs. Umme, however, is a fearless lady who not only stands up for herself but also for the disadvantaged community around her. Her numerous demanding experiences in her social work reveal this inner strength and resolution, encouraging her to never give up. This field task was extremely difficult. We had to travel for 7-8 hours on a motorbike to reach the schools, which were located in the desert. Sometimes, it would take days to reach the right places. 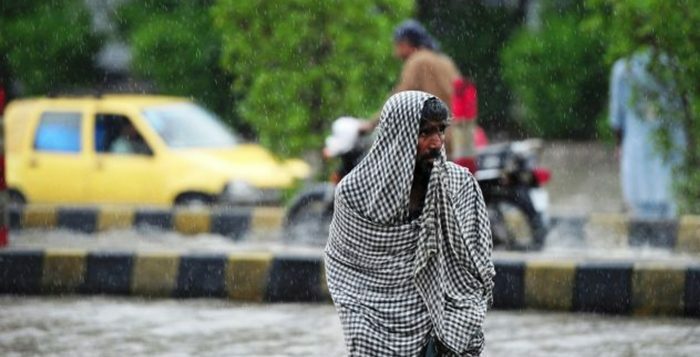 When we started working in the field, we observed that people had to deal with manifold issues; low income, poor health, food, education and others. As Umme and her husband sought to empower struggling communities, the communities developed high expectations from the couple. Consequently, Umme and her husband decided to establish Social Youth Council of Patriots (SYCOP), which works with communities to improve their lives. SYCOP was registered in 1996 under a government act in 1961. 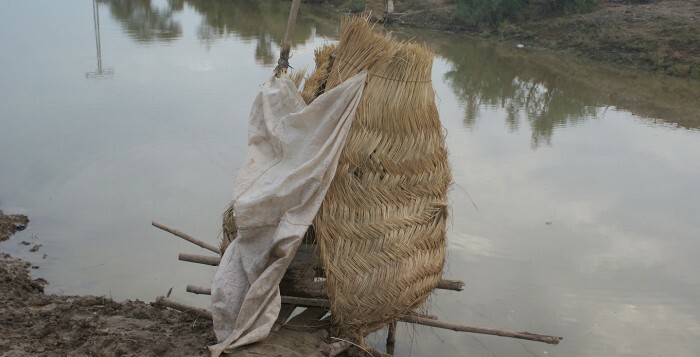 The organization had humble beginnings, as it began in a one-room office in Rajanpur. However, it slowly expanded over the next twenty-one years into a highly distinguished non-governmental organization. Umme and her husband first worked as supervisors in SYCOP, but after her husband’s death, Umme took charge as Executive Director. 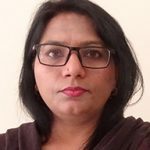 In addition to this role, Umme is a member of Zila Council Assembly and Punjab Commission on the Status of Women from Dera Ghazi Khan Division. 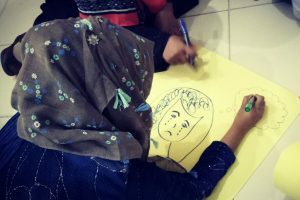 Notwithstanding her countless years of social work, Umme had never received proper training on social mobilization before she attended Community World Service Asia’s training in July this year. Rather, she learnt all her social mobilization skills through her fieldwork and had no knowledge of the specific tools used in social mobilization. However, this summer, Umme learned the fundamentals of social mobilization through the training in July. 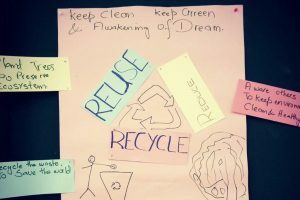 The training not only personally benefited Umme, but it also had positive impacts on SYCOP. Sharing this experience and conversing with participants has left me with innovative ideas and ambitions for the future. 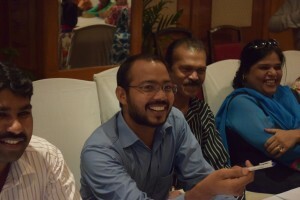 Furthermore, Umme learnt risk management and conflict resolution at the training. That was the first time I realized how important it is to go to a new community fully prepared. Social mobilizers should be aware of the underlying community conflicts and risks so that they can develop a risk management plan. Umme also appreciated the experience of conducting a mock survey on Disaster Risk Reduction with a trainer in a village since she learnt all the practical steps of initiating such a field survey. She particularly benefited from this exercise as SYCOP is also working on Disaster Risk Reduction, so she says it could help SYCOP to replicate the same activity with their communities. In the activity at the social mobilization training, the participants conducted a field survey on hazard identification and then held a community meeting. Another key part of the social mobilization training was cost management. The training improved Umme’s budgeting skills, so now Umme can discuss SYCOP projects with partners and donors with more clarity. Therefore, Umme is more confident in negotiating project agreements for her organization. Moreover, her communication skills have also improved through Community World Service Asia’s social mobilization training. These skills have helped her build contacts and linkages with other stakeholders’ including government departments, civil society organizations, communities and staff. Umme replicated the social mobilization training with the SYCOP staff and also shared training results with her board members. 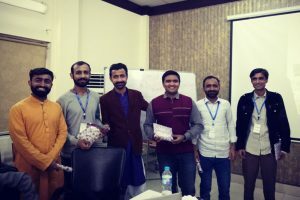 They plan to develop a social mobilization strategy for SYCOP, as the organization intends to register with the Security Exchange Commission of Pakistan at a national level. SYCOP has enhanced its’ mobilization skills, and now the staff is working on the field on challenging projects, such as reproductive health. 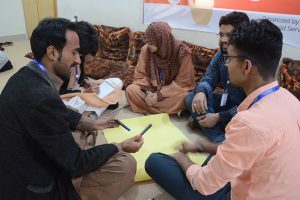 Umme believes that it is important to work with men first in order to break social taboos as it is difficult to get women participation in such projects. She said that her team discussed the health issues of women in the community with their husbands openly and made them realize to prioritize health needs of their wives. After listening to them, they acknowledged SYCOP for taking such useful initiatives and asked them to work with women and protect their lives. The social mobilization training met my expectation, and I am happy that I not only learnt myself, but also that I passed on the information to the other staff. In this way, I transferred the training’s benefits to the communities with which they work. I believe that there is no conflict which cannot be resolved through discussion. The Social Mobilization Training equipped Umme with necessary tools that will strengthen her social work, harnessing her potential to achieve even greater accomplishments in social mobilization. 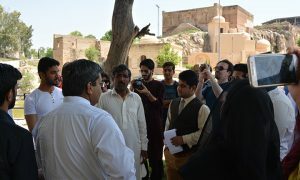 Local Leader sharing historical significance of Katas Raj with students from different universities during the exposure visit. Students from different universities exploring the Temples during exposure visit. 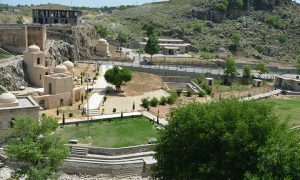 The Katas Raj Temples is a complex consisting of several Hindu temples surrounding a pond regarded as sacred by Hindus. 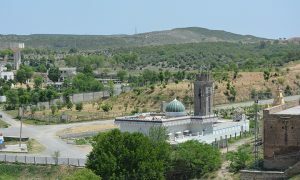 The mosque and temple in the same location area representing peace and harmony. 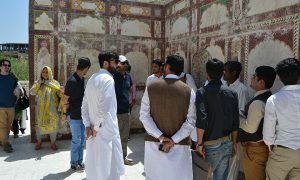 The delegation of students from various universities exploring the Katas Raj Temples. 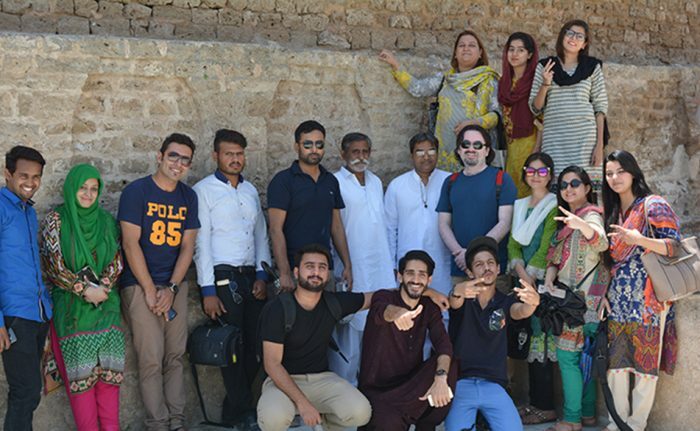 This May, thirty-two students from universities and colleges in Lahore, Faisalabad, Abbotabad and Peshawar, got together to visit the Katas Raj Temples located in the town of Choa Saidan Shah in the Potohar Plateau area in Punjab. 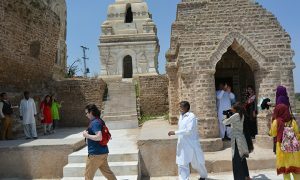 The trip among students was planned as a step towards strengthening relations among various youth groups through exploring Pakistan’s rich cultural history and recognizing the tradition of interfaith harmony practiced here in the past. Upon nearing the temples, the group crossed a huge cement factory and golden wheat fields, as the complex surrounding the temples, gradually became visible. Before entering the temple, the local experts and the guide of the Evacuee Trust Property Board (ETPB) narrated the history of the Satgraha Katas Raj Temple and explained the many religious practices that were carried out in each temple. The Katas Raj Temples complex originally consisted of a cluster of seven old temples, remains of a Buddhist Stupa and also some medieval sanctuaries and Havelis. However, today, only four of the seven temples are intact. These ancient ruins are scattered around a pond that practising Hindus consider sacred. The Katas Raj Temples signify a long history of interfaith synergy, as the site is also home to a historic mosque and another Buddhist temple. The students on the site were also told a Brahman tale narrating the history of the pond. It is believed that the pond was formed after Lord Shiva’s wife, Sati, died. Lord Shiva’s inconsolable grief at her death resulted in a flow of tears forming a pond at the Katas Raj Temples. With this story, the magnificent temples also represents unconditional love between partners. I have perceived that all cultures, religions and beliefs deserve the same amount of respect even if they are different.
. 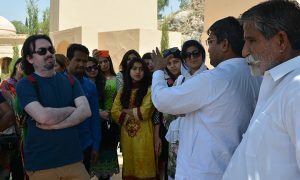 The Katas Raj Temples visit not only raised awareness about interfaith harmony, but also connected students from various universities. Students with disparate backgrounds were motivated to build an understanding regardless of race, color and religion. A traditional townhouse or mansion with historical and architectural significance.